Carpet Cleaning - What is the Best Method For You? - MacFawn Enterprises, Inc. Carpet Cleaning – What is the Best Method For You? A carpet shampoo is a tried and true method of cleaning carpets. 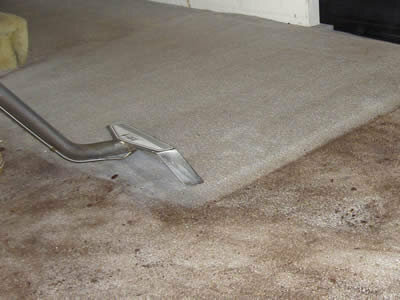 In this method, a carpet cleaning shampoo or solution is applied to the carpet to form foam. The ingredients of the foam attract dirt in the carpet. The solution is left to dry and once dried, the solution becomes brittle and separates itself from the carpet fibers. Now, the remains are collected with the help of a vacuum cleaner. Shampoo cleaning method for carpets is the most common method used for carpet cleaning, as it does not require any professional help and is a do-it-yourself job. All you need is a carpet shampoo and a vacuum cleaner! Steam Cleaning is another popular carpet cleaning method, as it is very effective. Steam cleaning actually does not use steam, but uses hot water. The temperature of the water is usually between 150 and 200 degrees Fahrenheit. Hot water is mixed with a detergent or cleaning solution and is sprayed on the carpet. Then, the dirt that is forced to come out is removed with the help of vacuum cleaner and stored in a holding tank. Steam cleaning is considered one of the best deep cleaning methods for carpet cleaning since hot water kills bacteria, fungi and dust mites. Dry Powder Cleaning does not use water, hence the name. The dry powder used is an absorptive material made of detergent, solvent, and a very small amount of water. This powder is sprinkled over the carpet and with either the help of rotating machines or using some elbow grease and a brush. The powder is thoroughly spread into the carpet fibers and left for about 15 minutes. Then, using a vacuum the powder and the dirt is removed. Foam Cleaning is a combination of shampooing and steam cleaning. With the help of a rotating brush, the shampoo is spread on the carpet and foam is formed. Then, the foam is left to dry for an hour or so. With the help of vacuum cleaner, the dirt is later removed. All of the shampoo may not be removed with the vacuum cleaner so this is where the steam cleaning comes into play.